Peter Houston is running the rule over a striker from Sweden a month before out-of-contract forward Rory Loy can talk to other clubs. The 6’5” trialist began training with the Bairns on Monday of this week after Houston revealed his imminent arrival to the club’s shareholders earlier this month. He comes recommended by Scandanavian contacts of the Bairns’ boss. “He’s a big powerful player we’re having a look at this week,” Houston told The Falkirk Herald. “He’s come over from Sweden and their season is finished now so there might be an option to look at in January,” he added. 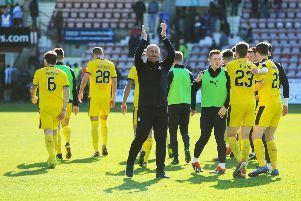 Since arriving at The Falkirk Stadium the manager has long held ambitions of signing another striker to partner or compete with Rory Loy in attack – though Botti Biabi has staked a claim for the position with strong recent performances. But the former Rangers and Carlisle attacker’s contract is winding down so the need for a striker becomes more necessary. Talks with Biabi over signing an extension are also on-going, though are more advanced than those with Loy and his representatives. In the meantime, Houston will continue to look at strengthening his offence. He signed David Smith from Hearts on deadline day and though he can play as a forward, the Abronhill boy has been deployed to a wide role more often this term. Rory Boulding was another attacking option, signed as a free agent, but he failed to force his way into Houston’s first team plans and is currently on gardening leave in Sheffield until his short-term contract expires in January. The Falkirk Herald understands any potential deal for the trialist would be a loan with his Swedish club keen to retain his services if an agreement can be reached.